Tempe, Ariz. • Roughly a half-hour before any other teams launched their Pac-12 schedule Thursday night, Utah’s basketball season already needed to be saved. 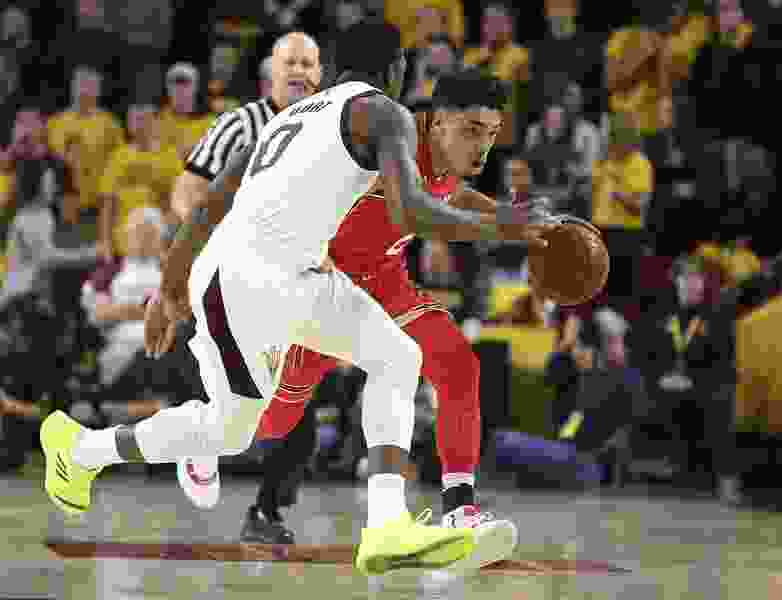 An undistinguished November and December fed into a horrible start of January for the Utes, who trailed Arizona State by 17 points midway through the first half. Absolutely nothing suggested what was about to unfold at Wells Fargo Arena. The biggest comeback of Utah coach Larry Krystkowiak’s eight-year tenure produced an 96-86 victory over a team that recently beat then-No. 1 Kansas. That’s what a 50-21 run in a 16-minute stretch in the middle of the game will do for you. Whatta game. 👏👏👏@UtahMBB came back from a 17-point deficit to win 96-86 against the Sun Devils. “I believe in this team; I keep saying it, ” said senior guard Sedrick Barefield, who scored 24 points. “We just got ourselves together … just kept believing in ourselves,” said sophomore forward Donnie Tillman, who added a career-high 22 points, plus six rebounds and five assists. The Utes validated that self-belief with a rally that required some poise in the end, after the Sun Devils (9-4) had cut a 12-point lead to three. That’s when Barefield emerged. If his once-confident teammates became slightly hesitant as ASU responded, Barefield played decisively. He scored 12 straight Utah points in one stretch, restoring a healthy lead. And when Tillman grabbed an offensive rebound and fed Parker Van Dyke for a 3-pointer, the Utes were back up by 10 and on their way to by far their most meaningful win of the season. Last year, Barefield’s late 3-pointer forced overtime in a win in Tempe. This time, he delivered one big shot after another, as he topped ASU guard Remy Martin’s 22-point night. ASU had followed that win over Kansas with a one-point loss to Princeton and fell out of this week’s AP Top 25, illustrating the state of Pac-12 basketball these days. Yet nothing should devalue what Utah achieved Thursday, especially the way it all happened. The Utes (7-6) needed a breakthrough like this to open conference play, after various analytics ranked them No. 10 in the Pac-12. ESPN’s Basketball Power Index forecasted a 6-12 league record for Utah, before the Utes went out and won a game that theoretically will be as difficult as any they play in the conference schedule. Utah’s performance was “an awful lot of fun,” Krystkowiak said, after a start that was just plain awful. The Utes were down 28-11 midway through the first half, when they “had a heck of a time with their pressure, getting ourselves into the offense,” Krystkowiak said. Utah’s transition defense was equally poor and the team looked overwhelmed by ASU’s athletic ability. And then it all changed, for one fundamental reason: Once the Utes started getting defensive stops and rebounds, their own offense flowed much more easily. The Utes shot 16 of 30 from 3-point range, getting good looks in transition and sharing the ball. And if it seemed somewhat silly for Krystkowiak to say last weekend’s game vs. No. 6 Nevada was lost when the Utes loafed through the warmup period at halftime, guess what happened? The visitors were back on the court with six-plus minutes left on the clock, went through almost a full-speed shooting session and then opened the second half with a 22-6 run to lead by 12. “How ’bout that?” Krystkowiak said. Crazy, how this stuff works. Having Tillman start the second half was a good decision by Krystkowiak, after freshman Riley Battin looked lost. Freshman guard Both Gach played with an ankle injury, but freshman forward Timmy Allen (17 points) performed well in a hometown appearance and Van Dyke scored all of his 13 points in the second half. The outlook for every Pac-12 team is subject to continual updating this season, but the Utes will be allowed to feel good about themselves as they travel down I-10 for Saturday’s game at Arizona.